I don’t know about you, but I find it very difficult to function when I skip breakfast – which, fortunately, doesn’t happen that often. And when it does, it’s not because I couldn’t afford to eat. Nutrition is the most basic of human needs, and sadly, this need goes unmet in many of America’s needy families. 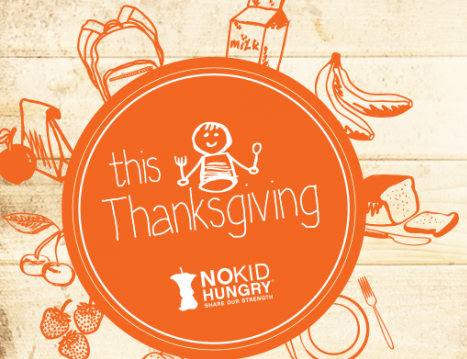 Did you know that 1 in 5 children (that’s 20%, people) won’t have enough to eat on Thanksgiving and beyond? Hunger is a serious problem unto itself, but also remember that it affects kids’ ability to learn and reach their full potential, among other things. This isn’t fair, and it honestly makes me angry. Share Our Strength is working hard to provide food, supplied and technical assistance to organizations feeding children through summer breakfast and lunch programs, and to improve access to school breakfast programs. The No Kid Hungry campaign needs our help – and helping is easier than you think. Amazingly, a $1 donation helps connect a child in need to 10 breakfasts. $18 helps a child eat breakfast every day of the school year (that’s 180 days/breakfasts)! I would love it if you joined me in supporting Share Our Strength’s No Kid Hungry campaign, by making a donation today. Thank you!